One might be excused for thinking that a group called “Concerned Neighbors Against Illegal Billboards” is a grass-roots organization of people who don’t like billboards, but in fact it was formed and funded by Clear Channel and other major L.A. billboard companies. The reason? 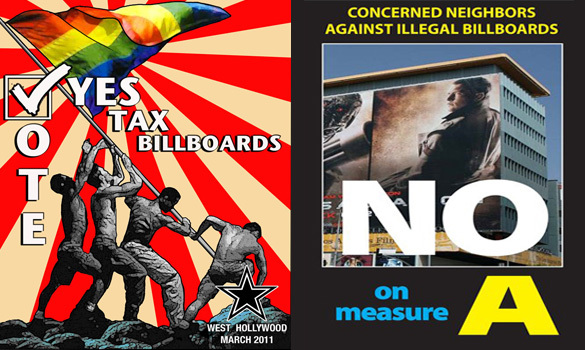 To fight a West Hollywood billboard tax initiative pushed by Michael McNeilly, owner of a company that has placed both legal and illegal “tall wall” supergraphic signs on multi-story buildings at various sites in L.A. If approved by voters March 8, the initiative, called Measure A, would impose a 7 per cent excise tax on outdoor advertising purchases in the city. But it would also allow “tall wall” signs on Beverly and Santa Monica Blvds., where they are now prohibited. The change would potentially be worth millions to McNeilly and his company, Skytag, Inc.
“Concerned Neighbors Against Illegal Billboards” describes itself as “A coalition of neighborhood activists, residents, businesses, outdoor advertisers, homeowners associations and seniors opposed to the permitting and expansion of illegal billboards.” In official filings with the city, John Duong, a vice president of Clear Channel Outdoor is listed as president, and Ryan Brooks, a vice-president at CBS Outdoor, is listed as secretary and chief financial officer. The group reported contributions of $75,000, with $30,000 each from Clear Channel and CBS Outdoor, and $15,000 from Lamar Advertising, another major L.A. billboard company. The only official group promoting the billboard tax is Sunset Strip, Inc., which reported spending $152,000 as of the end of last month, according to filings with West Hollywood. Sunset Strip, Inc. doesn’t have a statement of organization on file with the city, but incorporation papers filed with the state of California in 2004 list an address that is the same as McNeilly’s Beverly Hills residence.